Great news – Classic Monsters of the Movies is now bi-monthly from issue #13! But wait – isn’t that Michael Myers on the cover? Why, yes it is, and we’re celebrating the 40th anniversary of the release of Halloween with an exploration of the many reasons why Haddonfield’s favourite son is a classic monster. Our beautifully evocative cover painting by horror art maestro Daniel Horne is just the start, as you’ll soon discover that Halloween shares many characteristics with the golden age of Universal monsters and the Hammer Horror era. You might be in for a few surprises! Naturally, there’s a wealth of other classic horror goodness in issue 13 of Classic Monsters of the Movies. The relationship between Bela Lugosi and Boris Karloff comes under scrutiny in an insightful feature which examines the power dynamic between these two horror greats and their collaborations on the screen. Was Lugosi really embittered about the success of Karloff’s career, and did the Englishman resent his Hungarian colleague’s skills? It’s time to find out. This issue also contains a biography of Tod Browning, the hallowed disciple of the grotesque whose turbulent life was mirrored in horror movies ranging from Dracula to Freaks and The Devil Doll. You’re sure to have seen some of his movies, but there was so much more to the man himself. We also look at our passion for transforming monsters; werewolves and vampires barely scratch the surface of this monstrous subspecies that holds a perennial fascination for movie fans. Classic Monsters of the Movies #13 is the perfect addition to your monster magazine collection, with wonderfully reproduced stills bringing your favourite horror movies to life. World-class journalism immerses you in the motion pictures which we love so much, offering a fresh approach to the genre. 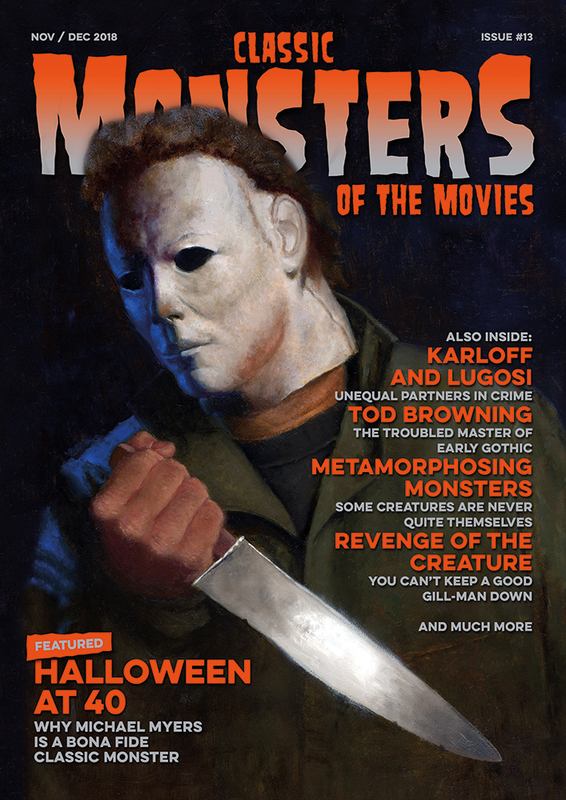 Wrapped up in clean, timeless design and stunning production values, Classic Monsters of the Movies is a horror magazine you can’t possibly afford to be without. Halloween – it’s 40 years since Michael Myers was unleashed, and the horror movie was never the same. It’s recognised as one of the first slashers, but this seminal movie actually has plenty in common with the more traditional classics too. Karloff and Lugosi – they had more on-screen chemistry than Dr Jekyll’s lab, but what was going on behind the scenes, and did it affect the way these two icons worked together? Metamorphosing Monsters – horror cinema is packed with monsters who spend their time shifting between identities. What’s the enduring attraction of shape-shifting creatures? Tod Browning – his often shocking work has played a crucial role in horror movie culture, so it’s only fair that we understand more about the man himself. Revenge of the Creature – the sequel to Creature from the Black Lagoon did a great job of developing the story of the Gill-Man, filling us with terror and pity alike. 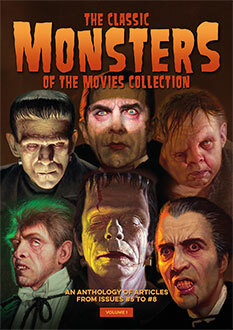 Issue 13 of Classic Monsters of the Movies is packed with lavishly restored stills printed to the highest quality. Full colour design gives this world-class publication a richness and style that you won’t find elsewhere, while professional journalism brings the classic horror movie genre to life. Classic Monsters of the Movies is the ultimate publication for any monster kid. To all involved in its production youve hit a winner here. 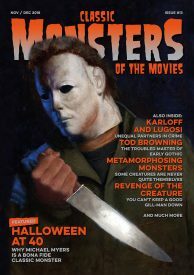 Nige Burton says that when it was announced they would feature Michael Myers in an upcoming issue the response covered the entire spectrum, from those who were excited and agreed the original Halloween is a true classic, to those who were “heartbroken,” even outraged, wondering how dare such “trash” be in Classic Monsters of the Movies. I for one stand firmly with the former! This excellent cover story article, with great colour and b&w photos, is now my second favorite monster article of all time ( Nige’s “Why We Love Classic Monsters” in Issue #1 being my favorite). Great job!